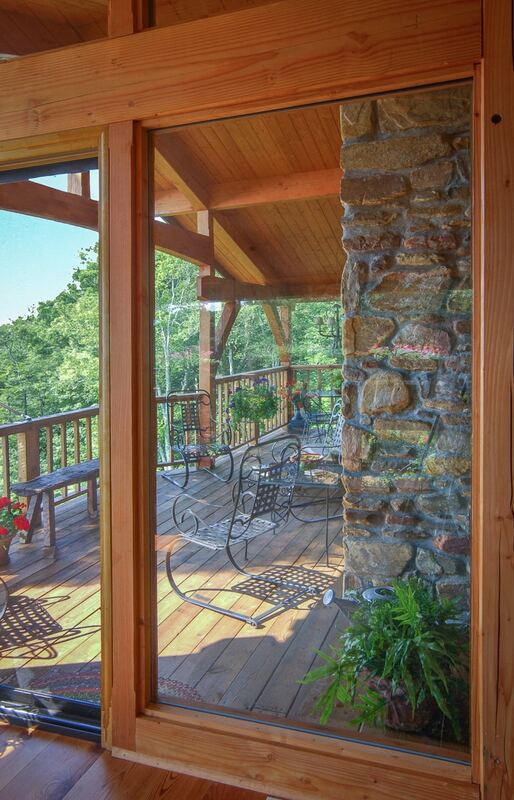 A structural timber frame porch from reclaimed timber in a mountain home in Highlands, NC. 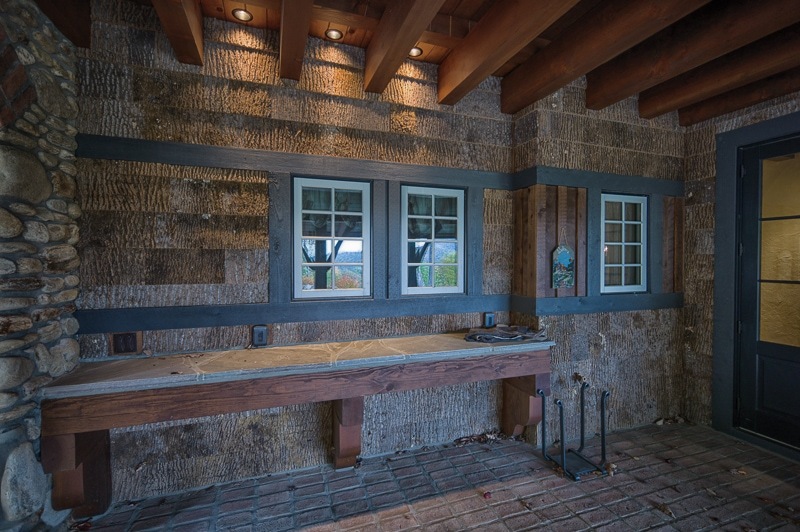 Design by RMT Architects in Vail, CO.
A sheltered back porch on a home designed by Bob Mann, of A.T.T.I.C. Design in Banner Elk. 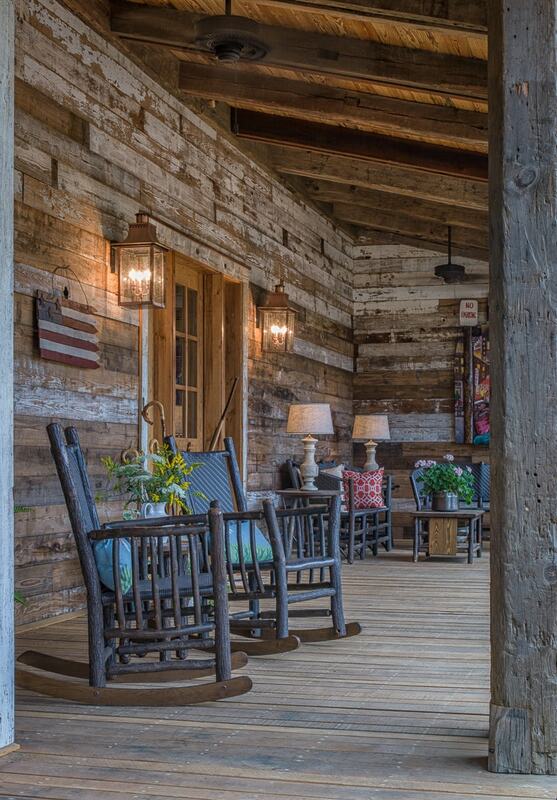 Note the Poplar bark siding, beautiful lighting, and brick patio floor. 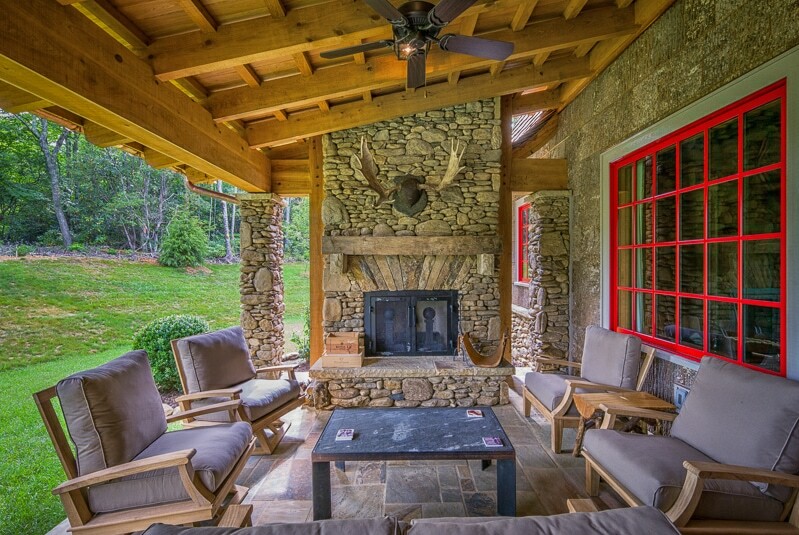 A bright red window provide provides a splash of color to the rock, Cedar timber, and Poplar bark siding on this mountain home in Linville, NC. We love how this Linville, North Carolina home opens onto the timber frame porch–creating 3 spaces from 2. 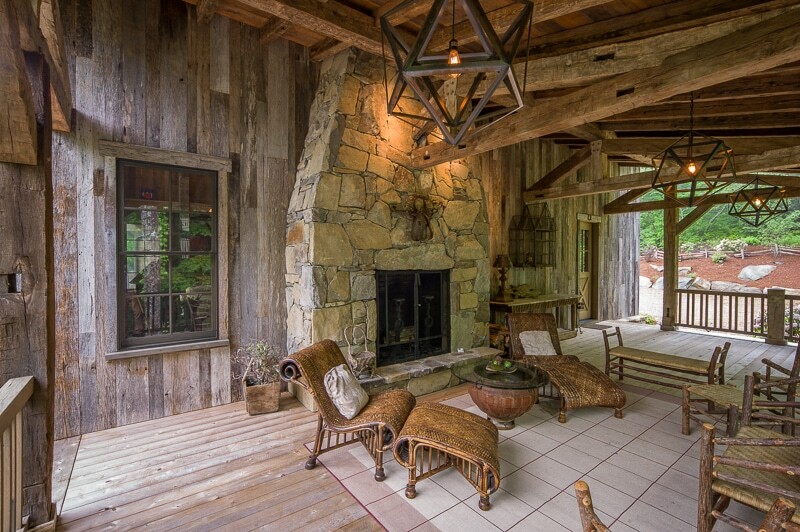 This back porch, off the Master Bedroom of a mountain home in Linville, NC, is framed by four Cedar columns with curved brackets. 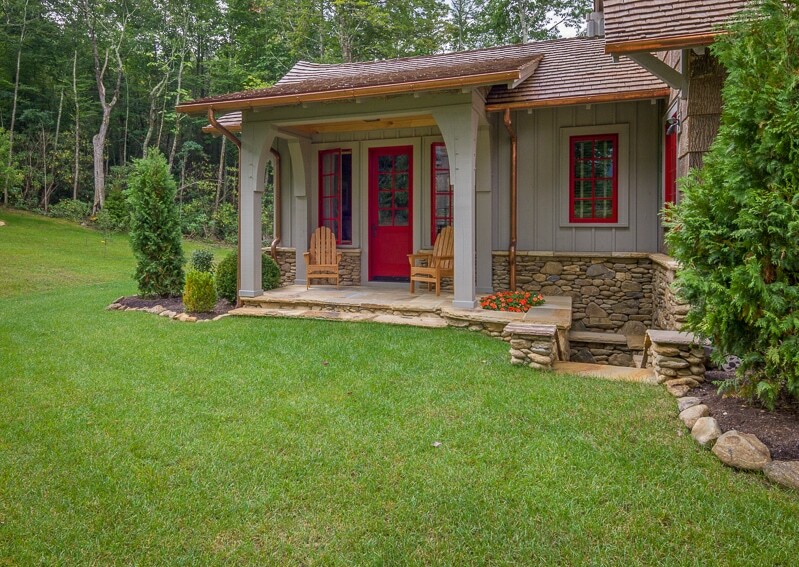 We love the red doors and windows, as well as the curving roof lines and attention to detail by Don Duffy Architecture in Charlotte, NC. No room on the site for a crane? 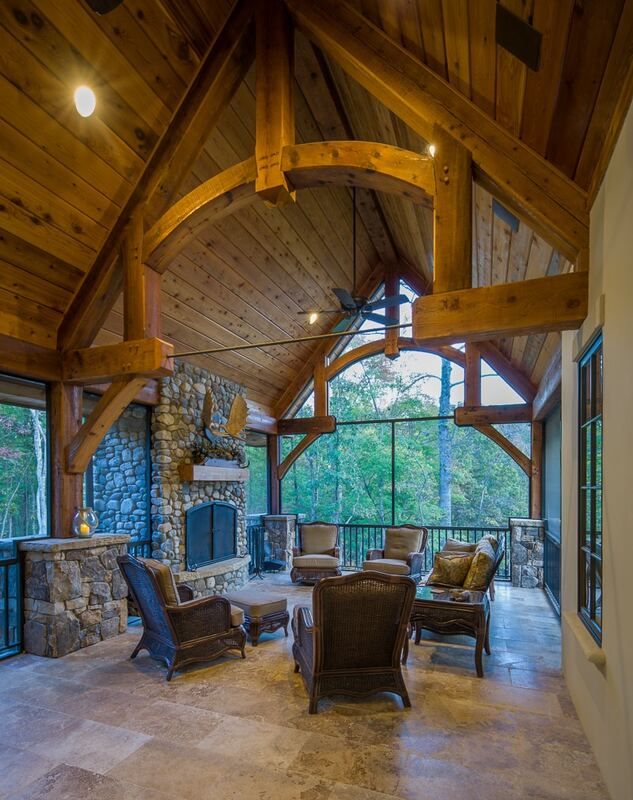 We raised these timber frame scissor trusses the old fashioned way (by hand) for this renovation and addition in Linville, NC. 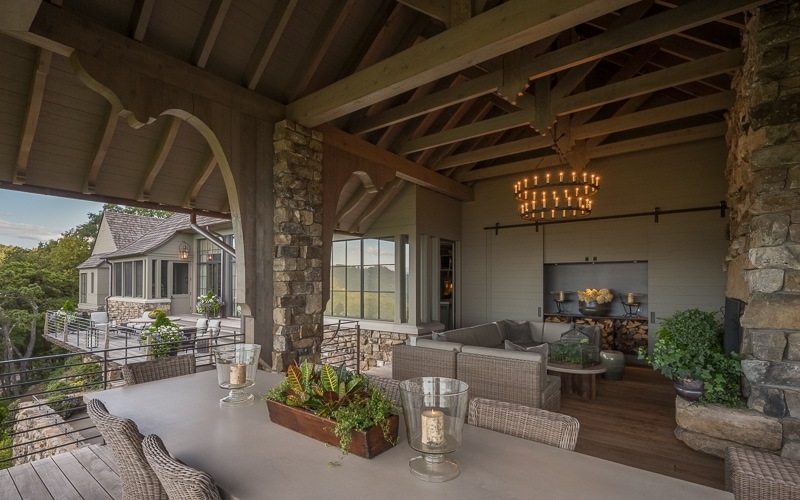 Design by Bradley G. Dowdy, AIA Architect Inc. 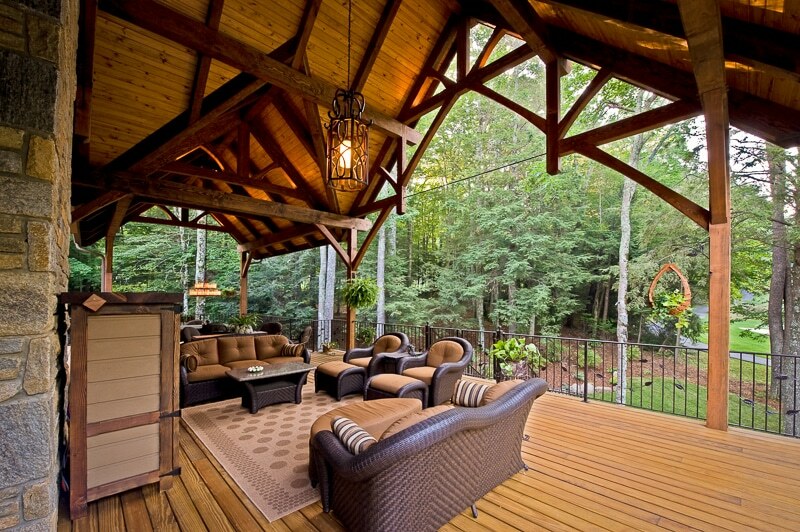 Although they’re wonderful living spaces, covered porches can darken the adjacent interior spaces. 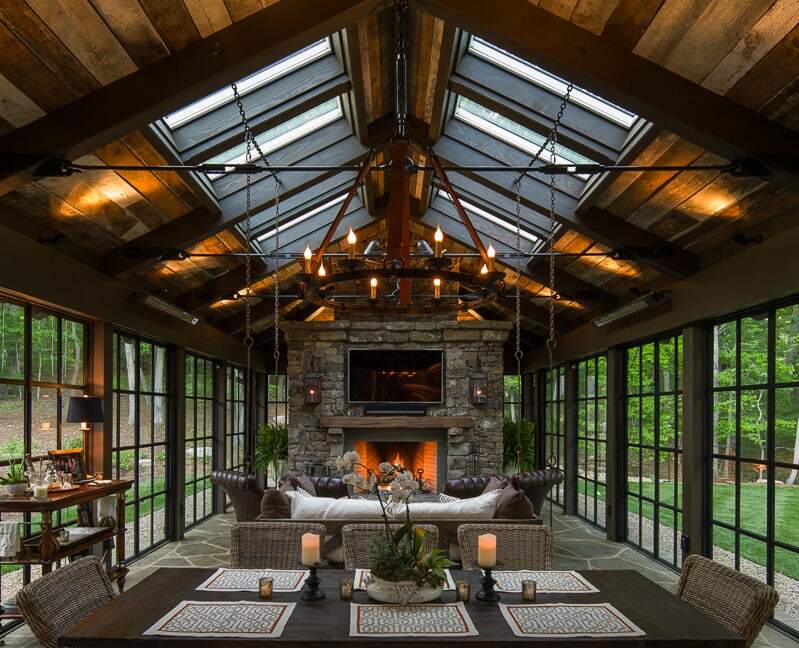 These Velux skylights not only enliven the Porch space, but also permit light to reach the interior of this timber framed “fishing cabin” in Linville, NC. 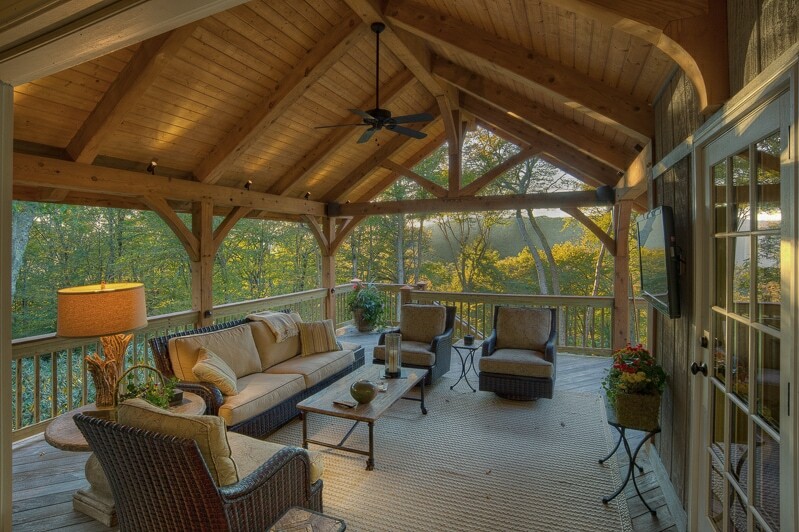 Timber frame porches can help achieve the sense of bringing the outdoors inside, or in this case, the inside out! 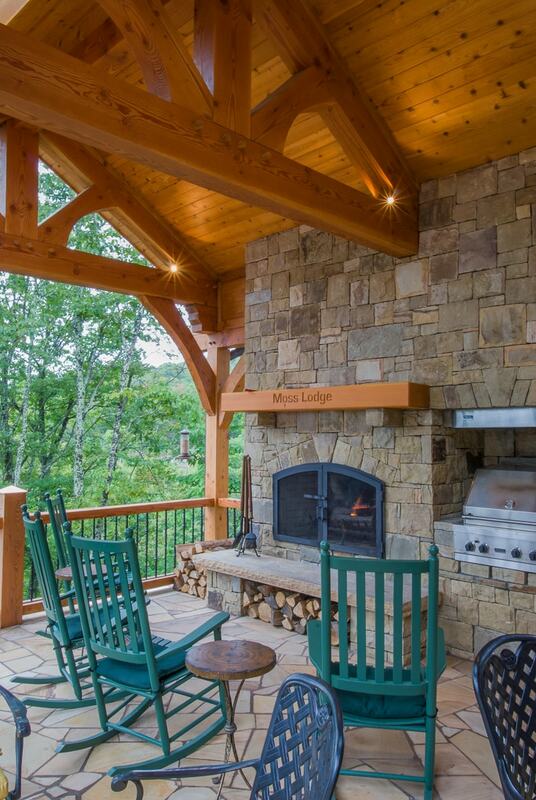 Douglas Fir timbers create a warm, inviting outdoor living space at Bob & Sandra Moss’ home in Elk River Club in Banner Elk, North Carolina. 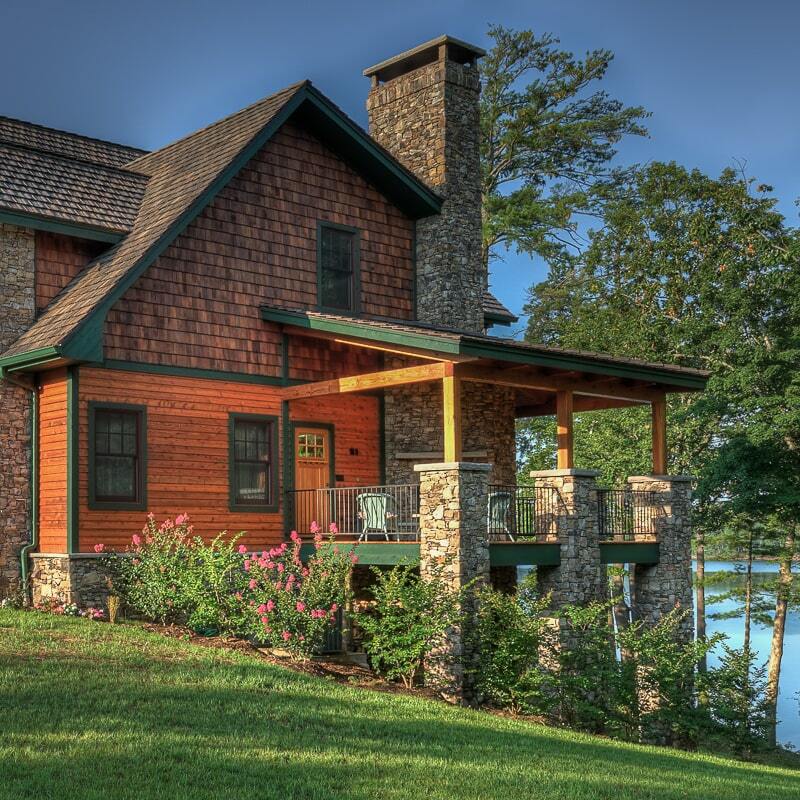 Bill & Gena’s timber frame lake house overlooks the South Holston Lake from the Bristol, TN side and across to the Cherokee National Forest–where the Appalachian Trail crosses the ridge visible in the distance. For years our client had admired a particular lake as he flew over, on frequent trips from Southern California. 13 years later, he and his wife purchased their lot on Lake James (a large reservoir in the mountains of Western North Carolina). Later that afternoon, the salesman left them the keys to the pontoon boat. Once out on the water, Matt realized it was the very same lake, and turned to Sherry to say “you’re not going to believe the story I’m about to tell you”. 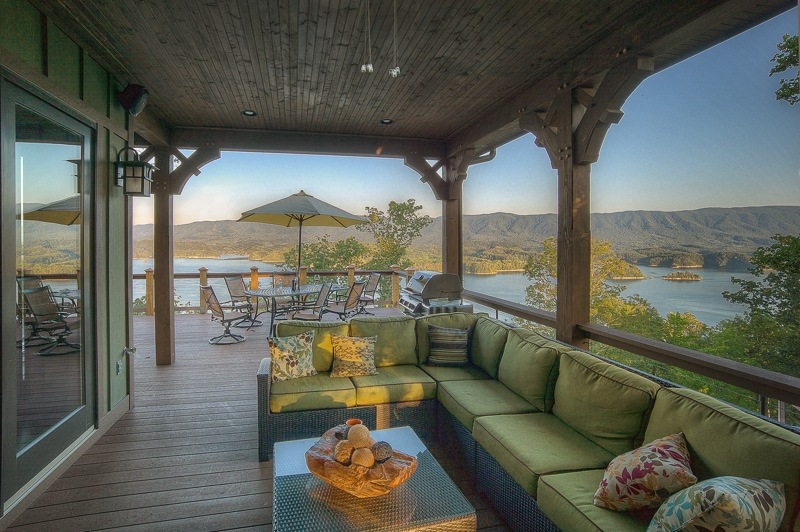 This wrap-around porch beautifully frames the view of the lake he had observed for years from the air. 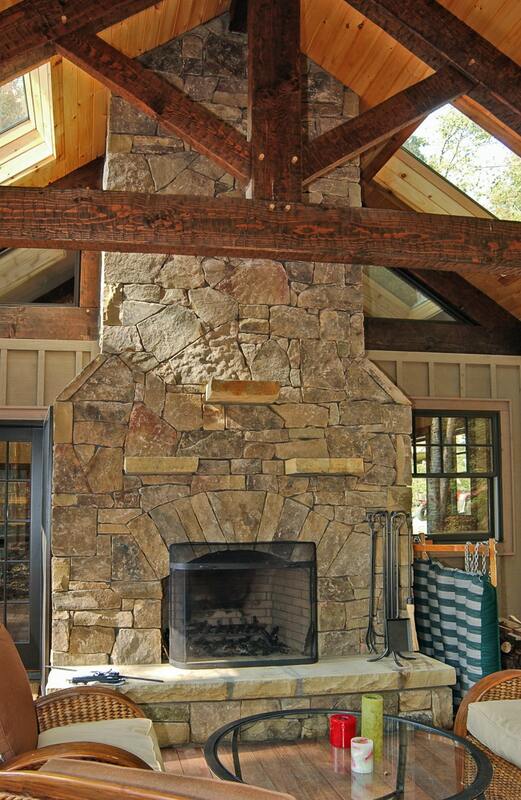 Although Carolina Timberworks is a licensed General Contractor, we rarely build homes. Every once in a while we take on a building project, as was the case with this renovation in Hound Ears Club for Margaret & Jimbo Rouse. 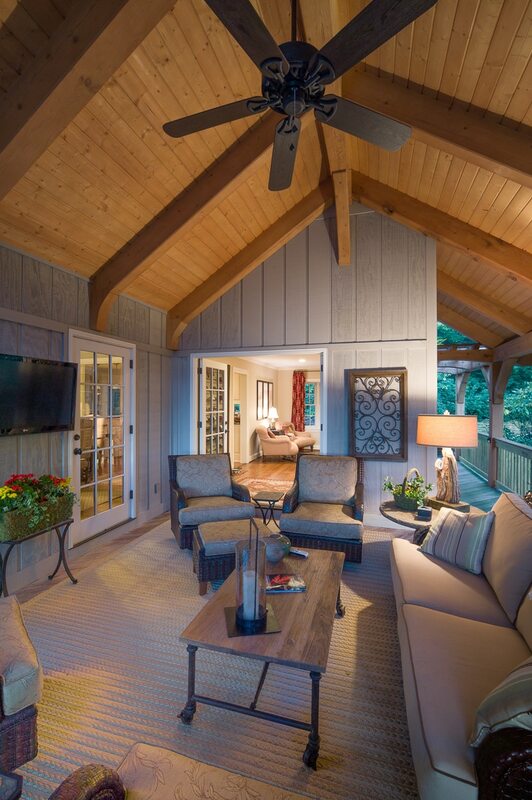 Most of the timber framing was outside (Douglas Fir timber framed covered porch and entry). 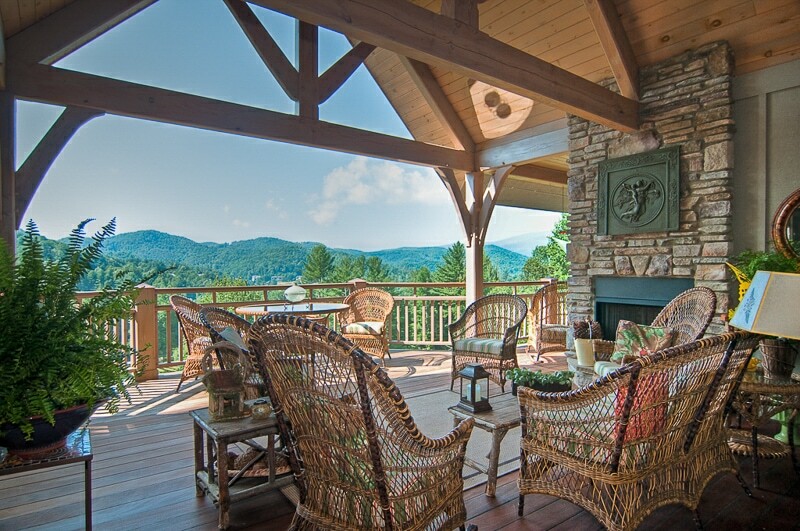 Ironwood (Ipe) decking with a stunning view of the profile of Grandfather Mountain. Design & photography by Drew Sumrell of Woodborne Design. 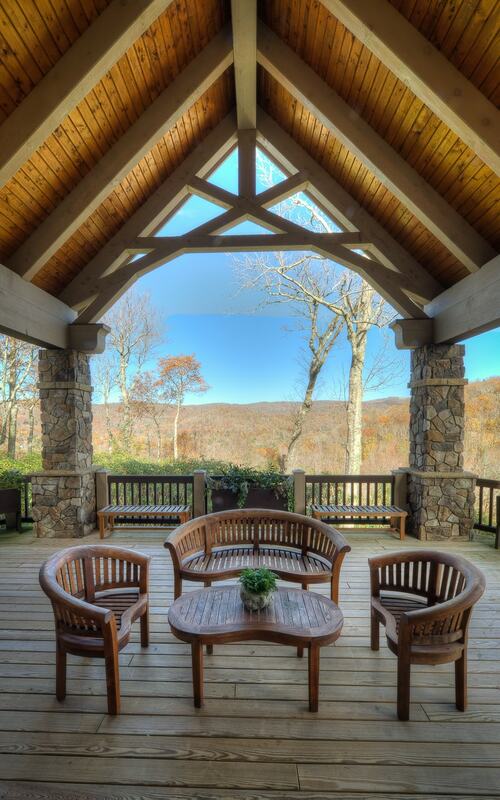 Notice the ceiling of this covered porch in Grandfather Golf & Country Club in Linville, NC. 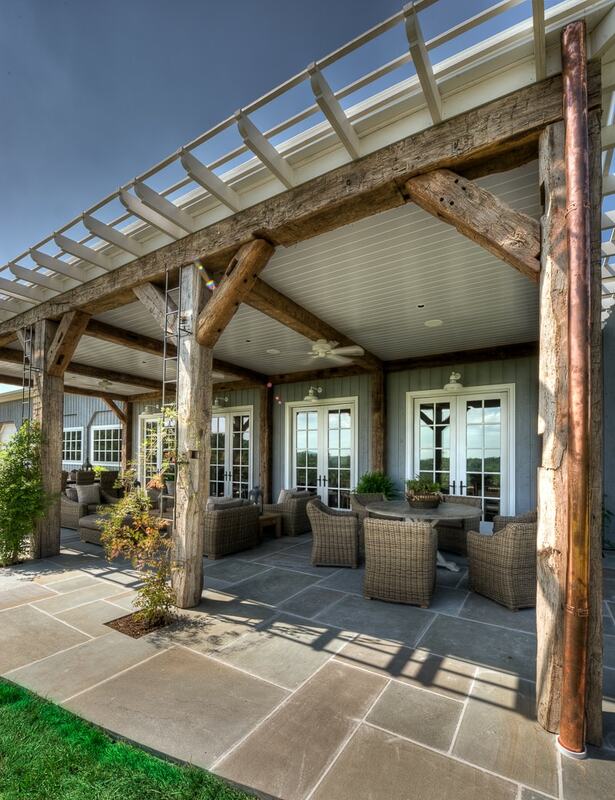 Sometimes “wood on wood” can be a bit much–even for us! A great way to solve this issue it to provide strong contrast between the timbers (Douglas Fir) and the 2×6 tongue and groove ceiling decking, which in this case was stained a much lighter color. The result puts the emphasis on the timbers. 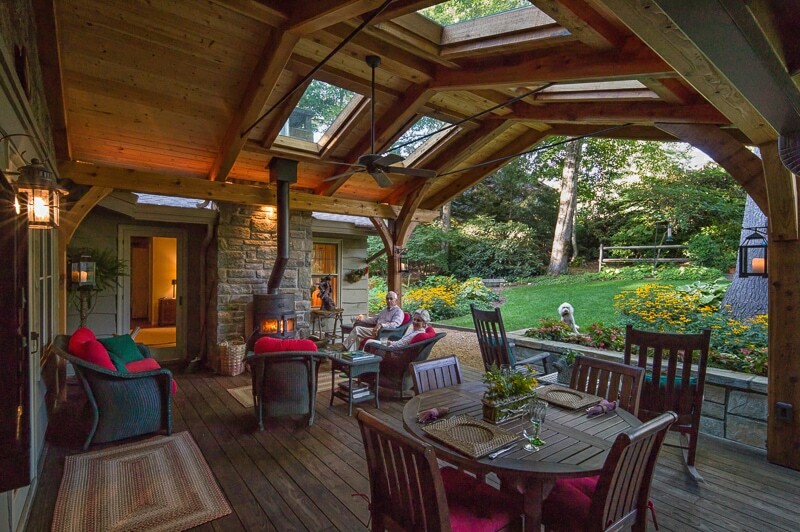 One of our early projects–a timber frame porch addition for a home in Minneapolis…North Carolina. Griff and Joanna found out about us when Joanna was getting a massage and Griff looked up and saw our sign at our first office in Banner Elk. 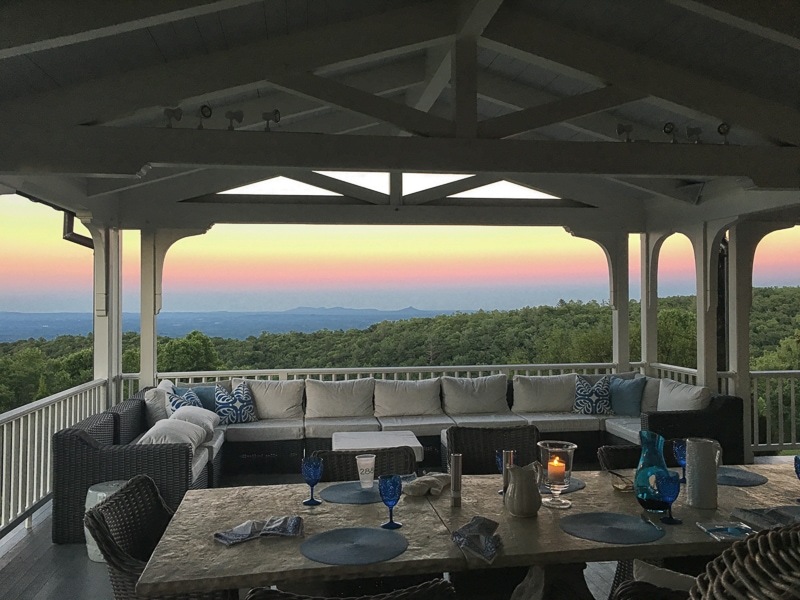 Greg, Mary Ann & Baxter Poole relaxing on a late summer’s evening on their Cedar timber frame covered deck in Blowing Rock, NC. 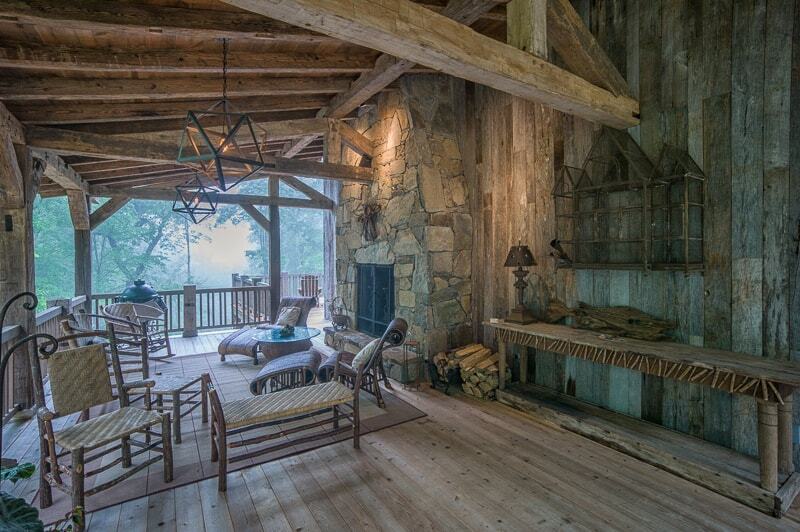 A striking 36-ft by 18-ft. four-season pavilion in Asheville, NC with a reclaimed wood ceiling. Profiled in the September 2015 issue of Fine Homebuilding magazine in a article called Glass in the Garden.